This salad is sure to impress friends and family! Heat a non-stick frying pan until searing hot. Sprinkle a quarter of the grated Parmesan cheese into the centre of the pan in a circle about 10cm/4" in diameter. Add a good sprinkling of pepper and cook for 2–3 minutes until the fat starts to separate from the cheese and bubble. Remove from the heat and leave to cool for 1 minute. Using a spatula, remove the melted cheese disc from the pan. Shape the cheese basket around the end of a straight-sided tall glass and hold for 30–60 seconds until set. Transfer to a wire rack and allow to cool completely. 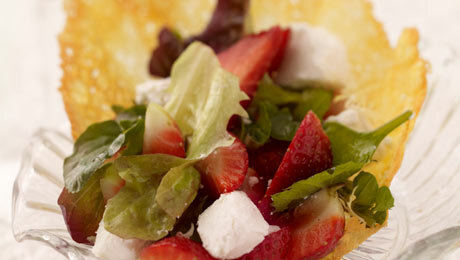 Place the goat’s cheese in a bowl with the strawberries, chives, mint and mixed leaves. Drizzle enough oil to barely coat the mixture. Spoon the dressed fruit and salad mixture into the cheese baskets, allowing it to tumble out on to the plates.